The Cactaceae family, with about sixteen hundred species, is cultivated worldwide for fruits, forage, fodder, and even as a vegetable. Cacti are recognized for their attractive flowers, special stem shapes, and ability to tolerate drought. Because of their efficient use of water and other adaptations, biological and agronomic interest in cacti has soared. These fascinating plants also have much to teach us about biodiversity and conservation. Yet a current, synthetic, wide-ranging reference on cacti has not been available until now. This comprehensive book, compiled by a well-known cactus biologist, includes authoritative, up-to-date chapters by thirty-five contributors from around the world on topics ranging from evolution to biotechnology. It is the first book of its kind to compile information on cactus biology, ecology, and uses in one convenient place. 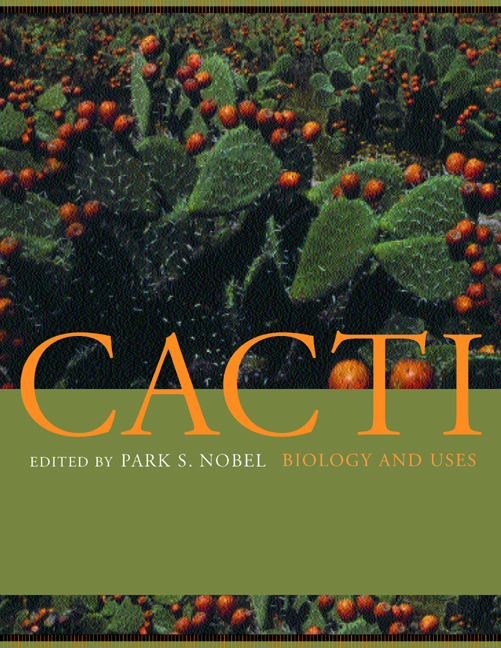 The first half of the book provides a thorough overview of cactus biology and morphology and discusses the environmental and conservation issues that affect the plants. It includes a discussion of the evolution of the family, paying particular attention to new genetic and molecular approaches. The second half of the book focuses on the practical concerns of cultivating cacti, such as pest control and diseases, horticultural and forage applications, and techniques for agronomy. Other chapters cover the different markets for cacti and products that are made from them. This unique volume will be a reliable and informative reference for ecologists and environmentalists, agriculturists, plant biologists, and anyone seriously interested in these remarkable plants. Park S. Nobel is Professor of Biology at the University of California, Los Angeles. He is the author of eight books, including Physicochemical and Environmental Plant Physiology (second edition, 1999), Remarkable Agaves and Cacti (1994), Environmental Biology of Agaves and Cacti (1988), and, with A.C. Gibson, The Cactus Primer (1986).